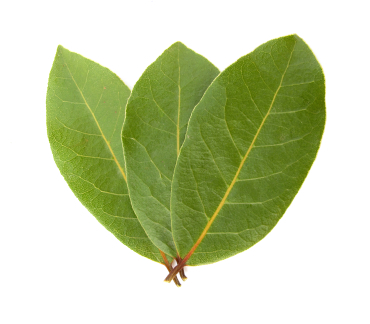 Laurel Leaf essential oil, (Bay Laurel), from Crete, has a sweet, pleasant, spicy somewhat medicinal odor. The dry out notes are much finer than eucalyptus or cajupet. The aroma is clean and has a faint fruitiness. The health benefits of Bay Essential Oil can be attributed to its properties like anti septic, anti biotic, anti neuralgic, anti spasmodic, analgesic, aperitif, astringent, cholagogue, emenagogue, febrifuge, insecticide, sedative, stomachic, sudorific and tonic. This oil is extracted by steam distillation of fresh leaves of Bay, whose scientific name is Laurus Nobilis. Main constituents of Bay Essential Oil are alpha pinene, alpha terpineol, beta pinene, chavicol, geranyl acetate, eugenol, limonene, linalool, methyl chavicol, myrcene and neral. Bay tree is a native to Caribbean Islands from where it is believed to have spread to other parts of the world. Bay held an important place in the Ancient Rome and Greece, both in their religion, culture and in their medicines. * Anti Septic: Wounds should not be taken for granted, even if they look humble, more so when they are from iron objects, rusty or otherwise, or from dirty or unclean objects. Wounds are very much prone to Septic or Tetanus, resulting in severe convulsions, cramps, breathlessness, pain, hydrophobia and even insanity. The anti septic property of this oil protects wounds against such infections and inhibits bacterial growth and helps avoid those painful situations. * Anti Biotic: This oil is also known for its anti biotic properties. That means, it inhibits any sort of biotic growth (growth of microbes, bacteria, fungi etc.) in the body, effectively safeguarding you against the infections. There is one more advantage of using this oil as an anti biotic. It is completely safe and has no adverse side effects (unless used in very heavy doses), unlike those anti biotic medicines available in the market which cost heavy on the liver, heart and other internal organs. * Anti Neuralgic: Neuralgia is very painful and it leaves almost the entire oral zone, including the throat, ears, tonsils, base of the nose, larynx and pharynx and the surrounding areas suffering from severe pain. It is caused due to compression of the Glossopharyngeal or the Ninth Cranial Nerve by the surrounding blood vessels which tend to swell when excited or stimulated as a result of chewing, eating, laughing, shouting or any other excitement or movement in that region. Essential Oil of Bay has analgesic and astringent properties, each of which helps get relief from the pain of Neuralgia in its own way. Being an analgesic, it reduces the feeling of pain in the affected area. Then, being an astringent, it induces contraction in the blood vessels, thus relieving the pressure on the cranial nerve, giving immediate relief from the pain. * Anti Spasmodic: Cramps, coughs, aches, diarrhea, nervous afflictions and convulsions are some of the ailments caused by Spasm, which is an excessive contraction in the respiratory tracts, muscles, nerves, blood vessels and internal organs. Not only does it cause the ailments discussed above, but sometimes it can also become fatal if it is excessive. For example, excessive spasm in the respiratory system can leave somebody breathless or choke him. The Essential Oil of Bay gives relief from spasm by relaxing the contraction and helps avoid the related dangers or ailments. * Analgesic: An analgesic, like this Essential Oil of Bay, reduces pain, and is particularly effective in pains resulting from cough & cold, viral infections, influenza, sprain etc. This again, is better than the analgesic pills available in the market which cause damage to heart, digestive system and nervous system. * Aperitif: Loss of appetite is a very common problem with those leading a metropolitan way of life, with excessive pressure of works in the office as well as at home, a never-ending run for money and almost no time to relax or exercise. This loss of appetite eventually induces acute deficiencies in them. So, an appetizer or aperitif can be a helping hand in these cases. And what’s better than an herbal aperitif like this Essential Oil of Bay to help them have a sumptuous lunch or dinner. * Astringent: We have already read above that astringency can be beneficial in treating painful conditions like Neuralgia. But it is not its sole benefit. An astringent’s main behavior is to induce contractions in muscles and tissues. This contraction helps in many ways. It strengthens grip of gums on teeth, pulls up the sagging skin and muscles, strengthens hold of scalp on hair roots thereby preventing fall of hair and finally, it induces contractions in the blood vessels thus helping stop hemorrhaging. * Cholagogue: Bay Oil promotes discharge of bile into the stomach, thereby helping maintain the acid & base balance in it. This bile is used to break down the complex food molecules and to neutralize the excess acids discharged into the stomach, which is very important since this excess acid can wear down the inner lining of the stomach, causing ulcers. * Emenagogue: This property of Bay Essential Oil is effective in turning on the obstructed menses and making them regular. It also eases the pain and other troubles associated with periods. * Febrifuge: Since certain components of Bay Oil are capable of fighting infections causing cough & cold, fever etc., this oil helps reduce fever. Its sudorific property also contributes to this, since perspiration helps bring down body temperature. * Insecticide: Being lethal for insects and lower animals is yet another beneficial property of this oil, which helps drive away insects. This can be used in fumigants, sprays, vaporizers and in other ways to keep away insects. * Sedative: This oil sedates nervous afflictions and disturbances and helps get relief from conditions like epilepsy, hysteria, convulsions, anxiety, stress, depression, anger etc. * Stomachic: Stomach is the root to health and is the root to all health problems too. Any malfunctioning by the stomach results as an ailment. As long as it is functioning well, the total health remains fine. This is exactly what Bay Oil does. It keeps the stomach functioning fine and maintains it in good health, keeping it safe from infections, ulcers, acidity etc. * Sudorific: Bay Essential Oil promotes perspiration and facilitates removal of toxins, excess salt, water, fat etc. from the body through sweat. This makes the body lighter and safe from ailments caused due to accumulation of toxins, salt and water in the body. Perspiration also brings down body temperature in case of fever. * Tonic: This property of Essential Oil of Bay is beneficial for the whole body. It improves the metabolic functions like decomposition of food and absorption of nutrients by toning up the liver, stomach and intestines, helping you grow stronger and healthier; takes care of proper excretion; regulates the endocrinal secretions of hormones and enzymes and also tones up the nervous system, thus making you more alert and active, and finally, boosts the immune system, protecting you from infections. * Other Benefits: The Essential Oil of Bay is equally effective in symptoms like rheumatism, neuralgia, muscular pain, circulation problems, cold, flu, dental infection, diarrhea, skin infections and promoting growth of hair, general health of the scalp etc. Few Words of Caution: Due to presence of high concentration of eugenol, this oil can cause irritations in skin and mucus membrane. It should be avoided in pregnancy. Blending: Bay Essential Oil blends with a whole range of essential oils, including essential oils of Cedar Wood, Coriander, Eucalyptus, Geranium, Ginger, Juniper, Lavender, Lemon, Orange, Rose, Rosemary, Thyme and Ylang-Ylang.